The international requirements regarding the biological safety for medical devices that are internationally accepted has been partially changed subsequent to the revision of International Standards for medical devices (ISO 10993-4, 9, 10, 13, 16). Therefore, it is necessary to advance the national standard requirement through conforming to the new international standard, to improve the safety and quality level of medical devices distributed domestically. Provisions are to be newly drafted within the contexts of General Standard regarding the biological safety of medical devices in order to clearly define the purpose of the Standard and the scope of its application. The efficiency of managing Standard requirement is to be improved by systematically keeping in context the purpose of Standard Specification and the scope of its application. To revise Standard Specification regarding the biological safety and the test methods (Appendix). There is a concern for the growing possibility of confusion that may occur to applicants and potential risks to patients because certain test methods are not internationally consistent regarding the current General Standard Specification in Korea concerning the biological safety of medical devices. Examples of the evaluation test methods concerning the appropriate blood conformity of medical devices that come in contact with blood are to be clarified (Appendix Section 4). A flowchart is to be added in order the systematic test designing to be allowed regarding the in-vivo decomposition per medical device ingredient (polymer, metal, ceramic, etc.) (Appendix Section 8). Alternative test methods for animal experiments are to be added in order to evaluate the effects of skin irritation (Appendix Sec. 9). ※ To introduce test methods such as the effects of skin irritation using artificial skins that are human-derived, or the evaluation of eye irritation using bovine eye of the slaughtered cattle. Test methods are to be proposed for the evaluation of polymer ingredient (e.g. polyurethane) cracking phenomenon that results from the exposure in the chemical or biological environment (Appendix Section 12). 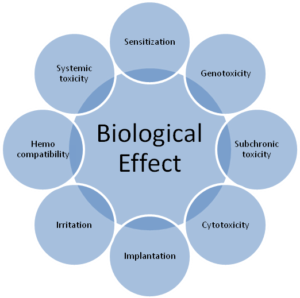 It clarifies that toxicokinetic tests are to be considered when there are active ingredients within the biological materials, which may be released from biodegradable medical devices (Appendix Section 15). See the original notice here.